Are we amused ... or not? We welcome your reviews of productions, the plays, the process, the problems or any other feedback you care to give. Some of these are fairly lengthy, but we've included every word sent to us! "..this play is hilarious and I thoroughly enjoyed reading every sentence. Genuinely laugh out loud funny." "This is a quick, imaginative and at times surreal comedy"
"The dialogue is quick, witty and often fantastically unexpected"
"A fantastic play which has had me laughing each time I read"
Wow! Our big problem now is how to follow it! Our Year 6 children loved Spy School. The idea of a school for spies but with spies who were not all of the 'James Bond' mould filled them with enthusiasm. The different groups of spies were identified both by movement, name and costume ensuring that each child had 'their moment'- always important in a school production. The songs were great and the hauntingly beautiful 'We're in too deep' soon became a firm favourite as did the opening 'Spies'. A script full of characters including Father Christmas and Easter Bunny got everyone laughing from the first reading and 'We're on the case Easter Bunny' remained a catch phrase for the summer (and beyond). The play is so well written, with a plot which ensures that everyone stays involved right through to the end. A fabulous musical play which we would have no hesitation in recommending; great script, wonderful songs and a running tine of about an hour - ideal as a school production. We can't wait for Spy School - The Eighth Department. Spy School is a delightful play for primary aged children, incorporating lots of good characters, some punchy songs (and one hauntingly sad one), and a simple plot with a nice twist at the end. Most of the cast are tutors at a school for secret agents, and a particular quality of this script is that every one not only has words to say, but an individual character to develop, which can be exploited to the best of each child's ability. These are loosely based on gentle parodies of every spy tale ever created, from early cloak-and-dagger, through the trenchcoated shadies of the 1950s to modern tuxedo-clad Bond types, with gadget-wielding geeks, code crackers, the Men In Black, and a couple of science fiction robots thrown in for good measure. The plot revolves around three rookie spies - the brash, the nervous and the sensible - on their first assignment, for which they are far from prepared. On the point of giving up they receive help from an unexpected source, and accidentally outwit all their tutors, much to the glee of the headmaster (codename: Father Christmas) and his deputy (Easter Bunny). Finally, they are caught in the Catch 22 situation that if they show how well they have succeeded, they will also show how unsuited they are to the School, a dilemma they ingeniously resolve to bring about a happy ending. There were a number of reasons why I decided to produce The Dream Makers as a Year Six (ten year olds) production both practical and literary. Although its setting, plot and characters are individual and unusual, they all have an archetypal quality which raises the play out of the merely quirky and gives it a slightly mythic status. The principal premise of the play is that groups of people can occupy the same space without either knowing anything about the other. This resonates well with schoolchildren, who come to a clean and tidy school at the beginning of the day, and leave it dishevelled in the afternoon, only to find it pristine again the following morning. Who is responsible for tidying it? Magic? A team of secret operatives? What lies locked away in the cupboard marked 'Cleaners Only'? If we imagine that the cleaning team itself has no idea whose mess they are tidying, or how it occurs, we have a situation very similar to the Dream Factory. Each group of people, as in life, has the wildly imaginative, the realistic, the curious, and the wholly uninterested, and the results of each attitude are cleverly worked out. Another theme is that of forgetting. As children leave their primary schools, they disperse, and even best friends can end up widely separated. Is it best that they forget they ever knew each other? A discussion on this point was the most emotive of all those I and the cast had on the themes of the play. The groups of people are somewhat archetypal in themselves. On the one hand, the users of the Dream Factory, practical technicians and creative actors, and on the other, down to earth and mostly incurious 'Grounders', the put-upon but phlegmatic maintenance team. One of the practical benefits of play like this is that the three groups can rehearse quite a lot more or less separately, giving a director three times as much rehearsal time. Although the plot is somewhat fantastical, which could influence the way the play is staged, I wanted to use the fantastic elements in a magical realism sense, so that they occurred within a wholly realistic, work-a-day environment. Accordingly, my Dream Factory became DreamPalace Inc. with a corporate logo on its stationary and the work uniforms of the Grounders, and the Studio in which all the action takes place rather mundane except when the Dreams were actually taking place. The technicians, in particular, all worked behind a long work bench piled with the equipment of their trade and a fair amount of concomitant detritus, piles of paper, coffee cups and so on; and the Grounders swept up real mess into real black plastic rubbish bags. The actors are professionals at what they do, but it is fairly routine, and they spend most of their time sorting out their pecking order. Maintaining the archetype theme, the boys were dressed as James Bond (dinner jacket) and Woody (cowboy) and the girls as Action Girl (trousers) and Romantic Girl (floaty dress). The Grounders wore uniform boiler suits, but the backstage crew nothing special at all. Thus at the beginning of the play, for example, Keri could run through a door which literally became invisible to the pursuing Beka as she ran towards it. The division between the two halves of the working environment was marked by lighting. The grounders used glaring yellow overhead floodlights, while the production team worked in the semi-darkness of a rehearsal, with brighter lighting on the stage as the dreams took place. While they were working, an otherwise invisible door was lit by a distinctive red gobo, and the transition between the two states was marked, as suggested in the script, with a distinctive alarm, which gave just enough time for actors to scurry on and off and required. This unusual but semi-mythic stage having been set, the plot revolves around a Grounder (Keri) who escapes to become a Dream Actress, and the confusion of a mysterious Agent (Jude) who, having been sent, disguised as a Grounder, to recruit a new Actress, finds that she has already gone. Jude and his minders incidentally introduce the concept of an unseen infrastructure (including a whole department for vending machines), which not only places the action of the play in a wider context - the Dream Factory is clearly a fairly mighty industrial complex(!) - but also reminds the audience, and the cast, of the wider context of their own environments, of which, in the case of children, they know rather little. The dreams themselves can be developed hugely or minimally, and, given our limited rehearsal time and production team (just me), ours were fairly minimal. 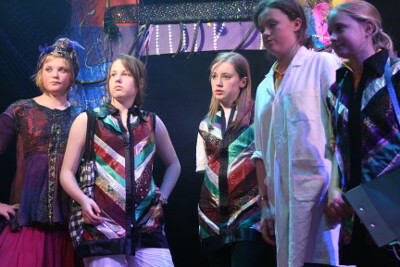 In keeping with their 'types', the cast developed a number of stereotypical aspects of anxiety, horror, romance, etc., each of which was presented as a mime to an appropriate piece of music (I can't remember which of our ten year olds suggested the theme from The Alien as the anxiety music - he certainly knew it better than I did!). As making a mess was an important part of each dream, appropriate material was strewn about the stage (shredded paper, rose petals, insects, seaweed, snow) during each one. Each dream was prefaced by a well defined preparation phase as the actors arranged the set and prepared their props, a suspense phase, as the actors waited for the dreamer to enter, and the dream itself, which began as the director called 'Action' as soon as the dreamer appeared. To cope with not having enough children, Dextra and Vextra were combined into one, Violet and Decibella (Sound and Light) became Indigo (a Boy), and Aestheta (Design) incorporated into Lacey (Costume) and Rouge (Makeup) as seemed appropriate at the time. Sadly the Security Guards were cut altogether. The last weekend of November saw me at the Conquest Theatre, and a double bill by the Youth Theatre featuring plays by both Barbara Hockley and her brother Rob - a talented duo. The first half was a tightly-written forty minute drama by Rob Hockley called Seeing Things. Dealing with the confused fantasies of a group of young teenagers, this could have been either grim or embarrassing, but the author had somehow combined acute observation of how real teenagers think and speak with his own wit and lightness of touch in such a way as to involve an audience of all ages. The star of the show was the geeky and utterly socially inept Brian, played by Alex Cofield so well we began to wonder if he hadn't revealed a best kept hidden side to his real character. Disturbed by apparitions whenever he felt heightened sexual tension, he decided to find out if they were real by trying to tape-record them, calling in his best mate Stuart and a group of Stuart's ex-girlfriends to keep the 'thing' level as high as possible. Stuart, played with nonchalant loucheness by Liam Stobart, was a self-assessed babe magnet with such overweening self confidence that not only did he not notice the clumsiness of his advances, but neither did his ex-girlfriends, who ended up begging to re-establish their relationships. The three girls were particularly well written, I thought. Each was given an individual character of her own, and the chance to earn our sympathy. Mary Ann Wall (Jo) was affectionate, generous and rather naively looking for romance, while Bethanie Evans (Belinda) was mostly out for fun, and Vicky Stack (Andrea) looking for what she could get. They were loyal friends, however, and tried to support Jo until the discovery of the tape-recorder under the bed led to a classic sit-com farce of misunderstandings, confused explanations, and eventually a happy resolution. This was a slickly performed and clearly very well-rehearsed play, that required no concession at all by the audience towards the youth of the cast. They all performed with energy, pace and the assurity that only comes from total confidence in their fellow actors, and there were lots of little bits of character-defining stage business that suggested considerable exploration of each part. Brian's bedroom and the drawing-room downstairs were simply but well depicted, and the action switched seamlessly between the two. It kept us both cringing and laughing from start to finish, and in the end keen to see more of Rob Hockley's work at The Conquest. The Conquest Theatre's Senior Youth Group gave us a splendid double bill at the end of last year, of which Rob Hockley's Darkness in the Night was the first part. His sister Barbara's version of the Orpheus legend is reviewed elsewhere, but the pair of plays made an excellent contrast and complemented each other very well. While the premise behind Darkness In The Night was fairly wacky, the real theme of the play was friendship, aspects of which were intelligently explored in the script, and delicately presented by the cast, whose acting was crisp and mature throughout. To begin with the plot, however - and it might help to read this next bit all in one breath! To protect her friend Lily from the unwanted attentions of Dave, Kate has persuaded Dave that Lily has died in an explosion. Lily, a reformed kleptomaniac, invites Kate to the abandoned house where she has stored her loot in order to dispose of it, while at the same time Dave drags his friend Bob to the same house, which he thinks is an ancestral home, to try to contact Lily's departed spirit. Inevitably the two pairs meet, Dave convinced that he has conjured Lily from the dead, and hilarious ramifications ensue. So far, so farcical, but amongst the witty and fast-paced dialogue across the sexes, there are wonderful moments of tenderness between the manic necromancer Dave and his stolid but ever-loyal sidekick Bob, and also between feisty Lily and her thoroughly down-to-earth companion Kate. It would be easy to lose this aspect of the play amongst the comedy, but skillful direction by Barbara and some very well-honed acting by the four protagonists meant we never failed to take their relationships seriously, even at the most absurd moments. By taking his part with total seriousness, Sam Collins (Dave) magnificently succeeded in convincing us that he really was crazy enough to think he could summon up the dead by immersing himself in heavy rock music, while Liam Stobart as Bob allowed his loyalty to override his incredulity with a beautifully studied low-key performance. Flora Harvey gave us a strong and determined Lily, and Alice Gaston who as Kate had to find true love and dump it again for the sake of her friend in the space of about five minutes, was heart-rending rather than absurd. The pace of the play called for an ensemble performance of a very high order, and these four young actors rose to the challenge with confidence and terrific success. Although sounding completely authentic for teenagers, Rob Hockley's script was full of finely crafted witticism, and carefully avoided the kind of slang that dates a play too precisely. This is the second of his plays that the Youth Theatre has taken on, and surely by now they have between them established a very high reputation. As usual the auditorium was much less than full, and I cannot emphasise too much what a treat you missed if you weren't there. In 'Perilous tales' the Conquest youth theatre gave us a mad, silly and inventive peek into a world of twisted fairytales where not all stories end happily ever after. A warning to all of us that too much happiness maybe our downfall, that being beautiful doesn't necessarily make you clever or popular, that having everything isn't everything and, most horrifying of all, video games can have you listening to ABBA for all eternity if you don't read the small print. An unsettling and macabre show populated with quite stunning decadent weirdness throughout whilst at the same time including singing and dancing and being thoroughly enjoyable for most ages. The singing by Mary Ann Wall was particularly fine and the dancing was riotously infectious with some interesting 'Thriller' moves and Alex Cofield providing some rather inventive and highly amusing moves of his own. Each part of the play used a fair range of different dramatic technique to highlight the abilities of its very capable cast. There was the wonderful pantomime Princess Loki played by Joanna Handley constantly clocking the audience with snide glances and comments. A surely typecast Matt Oliver as gorgeous Gerald, beset by plaintive ghosts, manipulative girls and unfeasibly large nails, playing completely and hilariously in verse. A madly modern couple robotically protecting their happiness with walls, and a wicked witches video game whose final level ends in the horror and madness of Saturday night fever. At each turn we were kept wondering as the weirdly macabre ensemble twisted and played with our expectations of how fairytales should be and even put in a few excellent morals at the end, as all good fairytales should. All in all the play was a huge success showing off the tremendous talents of the actors, and its writer and director Barbara Hockley, who must surely possess one the weirdest minds in the area. Mention must also be made of the staggering amount of time, effort and work put in by the lighting, sound and set design crew. In particular the costume design which was amazing and colourful and, bearing in mind that this show was only on for three short nights, simply had to seen to be believed. A truly wonderful and engaging performance which by the end had me dancing in my seat. Again! Again!